When MIDI data needs to be processed in very specific ways the MIDI Solutions Event Processor can often provide the perfect solution. The Event Processor offers 10 settings, each of which can be programmed with a unique MIDI processing function (for 32 settings see the Event Processor Plus). By combining these settings the Event Processor becomes an extremely powerful tool capable of processing MIDI events in almost any way imaginable. The Event Processor can map MIDI events or ranges of MIDI events to other MIDI events, filter MIDI events or ranges of MIDI events, trigger MIDI events, toggle between MIDI events, sequence through MIDI events, scale or crossfade MIDI messages, transpose notes, scale velocities, map to and from System Exclusive, NRPN, Bank Select messages, store incoming values in variables for later use... the Event Processor is like a swiss army knife of MIDI processing products, an indispensable tool in any MIDI musician's arsenal. The Event Processor works by comparing each incoming MIDI event with each of its 10 settings. When an incoming MIDI event matches a setting, the event is processed according to that setting. By combining different settings for different incoming events, the Event Processor becomes an extremely powerful tool capable of achieving a wide range of MIDI-processing functions. The Event Processor can be programmed to filter MIDI events and ranges of MIDI events. Ranges of MIDI events are filtered by selecting minimum and maximum values. For example, to filter all notes above middle C select Note #61 as the minimum value and Note #127 as the maximum value. There is also a Filter All MIDI Events setting that can be used in combination with other settings to allow filtering of all except a few MIDI event types. For example, to filter all MIDI events except Program Change events on MIDI channel 1, combine the Filter All MIDI Events setting with a setting that maps Program Change events on MIDI channel 1 to itself. Since each setting is processed, the combination of these two settings allows only Program Change events on MIDI channel 1 to pass through. 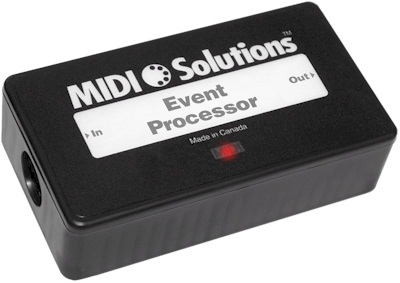 The Event Processor can be programmed to map any MIDI event to any other MIDI event. Multiple settings of the same MIDI event are accepted, enabling a particular incoming MIDI event to be mapped to multiple outgoing MIDI events, or multiple incoming MIDI events to be mapped to a single outgoing MIDI event. Ranges of MIDI events can be mapped by selecting minimum and maximum values to be mapped. Incoming and outgoing ranges can be different, allowing incoming MIDI ranges to be scaled to different outgoing ranges. For example, the incoming Control Change range 0 - 127 could be mapped to the outgoing range 0 - 100. Ranges can also be split into multiple settings, allowing custom scaling curves to be created. For example one setting could map the lower range 0 - 63 to 0 - 100, and another setting map the upper range 64 - 127 to 101 - 127. The Event Processor will also accept negative outgoing ranges, allowing values to be inverted and crossfades to be performed. For example to use an incoming Control Change message to control a crossfade between two other Control Change messages, map the range 0 - 127 of the incoming message to the range 0 - 127 of one outgoing message and to the negative range 127 - 0 of another outgoing message. The Event Processor can be programmed to trigger an outgoing MIDI event when the value of an incoming MIDI event falls within a specified range. Events are triggered by assigning a range of incoming values within which the outgoing MIDI event will be triggered. For example, to trigger a middle C Note-on event when a Control Change value passes below a threshold value of 64, select 0 - 63 as the range, and Note-on middle C as the outgoing MIDI event. When the Control Change value moves below 64 (i.e. into the range 0 - 63), the outgoing middle C is triggered. The middle C is triggered only when the Control Change first moves into the range - in order for the middle C to be retriggered, the Control Change value must first move out of range. The Event Processor can be programmed to step through sequences of MIDI events. Sequences can be as short as two settings causing the Event Processor to toggle back and forth between the two settings, or as long as 9 of the 10 total settings (at least one setting is required to define the sequence). Setting up a sequence of two settings is an easy way to turn a momentary function into a toggle function, even if the sending device does not offer it. For example, to convert a momentary footswitch that sends a value of 127 on depression and a value of 0 on release into a footswitch that toggles back and forth between the values 127 and 0 with each depression, set up a sequence of two MIDI events, one with a value of 127 and the other with a value of 0. Then use the incoming Control Change event of value 127 to cause the Event Processor to increment through the sequence of the two events. Only the depression of the footswitch (incoming value 127) causes the Event Processor to advance through the sequence, causing it to toggle between the values of 0 and 127 in response to each depression of the footswitch. Any setting of the Event Processor can be turned on or off on the fly in response to selected MIDI events. This allows settings to be activated and deactivated in a live application when time is critical and it is not possible to reprogram the Event Processor. Settings can be turned on or off when a specific MIDI event is received, or when a value of an incoming MIDI event falls within a specified range. Another application for turning settings on and off is mapping NRPN messages to Control Change messages. When a specific NRPN is received, the Event Processor can be programmed to turn on only the setting that maps the data value to the specific Control Change message. Then when a different NRPN is received, a different setting is turned on, mapping the data value to that Control Change message. The Event Processor can store the value of any incoming MIDI parameter in one of two variable locations, and use these values at a later time in any outgoing MIDI event. This is useful for keeping track of something that has happened previously and accessing it at a later time. For example, the Event Processor could store the current volume level, and apply that level to all incoming Note-on velocities. Even after the volume pedal has stopped moving the volume level still needs to be applied to the velocities, so the only way to accomplish this is to store the incoming volume level in a variable and then later apply the value stored in this variable to the velocities of incoming Note-on events. One of the best ways to learn about these functions is by downloading the MIDI Solutions Programming Tools software, it's quick to install and easy to navigate, and it's free for download, even if you haven't yet purchased the Event Processor. Spending a few minutes clicking on the different options is an excellent way to familiarize yourself with the Event Processor. The Programming Tools software also contains lots of example files that demonstrate the many applications of the Event Processor. For a more in depth look of everything the Event Processor has to offer read the Guide to the Event Processor and Event Processor Plus by Bruce Wahler of Ashby Solutions, this comprehensive guide explores in detail the amazing tasks these products are capable of! The Event Processor is programmed by sending it MIDI System Exclusive messages (read the Programming FAQs for more details). This is easily done with the MIDI Solutions Programming Tools software. Once programmed, the Event Processor's settings are retained even after power is removed. The Event Processor can be reprogrammed with new settings as often as needed. The Event Processor is MIDI-powered, and requires no batteries or power supply to operate with most MIDI products (for more information read the Power FAQs). A MIDI indicator LED lights up when the product is powered and flashes when MIDI data passes through it. Guide to the Event Processor and Event Processor Plus by Bruce Wahler of Ashby Solutions. Bruce Wahler of Ashby Solutions has written an excellent guide to the MIDI Solutions Event Processor and Event Processor Plus. This guide makes it easy to understand everything these amazing products are capable of!